So it was a week before hubby’s birthday and I was browsing through recipes and checking what would be an ideal cake suitable for this hot summer weather. 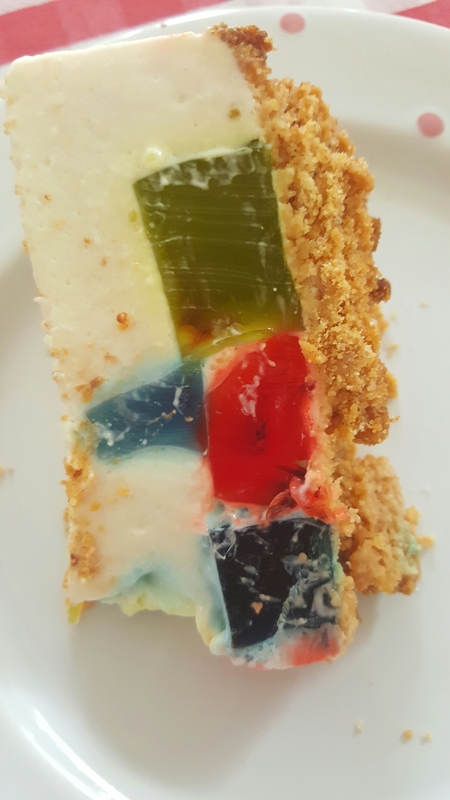 I remember going through a recipe for a stained glass cake which looked really awesome and colorful! I did want the cake to be different and decided to go ahead with the recipe. A creative stained glass effect cake. Using an electronic mixer, whip the heavy cream, vanilla, salt, and sugar until stiff peaks form. Pour the cream mixture with jello onto the biscuit base and refrigerate for at least 4 hours or for best results overnight! This cake is sure to be a crowd-pleaser and a hit with the family! 🙂 an ideal, refreshing and unique cake for a hot summer weather!